This chrome-plated footed cooling rack keeps your food from sticking to the bottom of a one-fourth size bun / sheet pan. The raised rack also serves as a cooling rack for baked products. It's ideal for holding food while icing, displaying, or drying. I use these quite a bit for cooking as opposed to cooling. While I've managed to rust and warp other brands, these have been going pretty strong! They're well made and sturdy. I love this cooling rack for small jobs! It fits on a quarter sized sheet pan perfectly, and I bake on it as well as to elevate pretzels off the surface when I coat them with oil and then salt/sugar. Works great for any of these purposes! I bought these because I needed some smaller drain pains for individual items that I was soaking. They are nicely made and they fit snuggly into a 1/4 sheet pan, which is something that I was looking for. Definitely gets the job done. I will say that this fits my Vollrath pan perfectly but not some of my other branded ones, so make sure you double check your measurements. Happy with it though! This is my new favorite cooling rack. It's a great size because it fits easily in a cabinet, and you can combine 2 or more to get a larger cooling surface. I also like using it in a quarter sheet pan to catch drippings. Fits in the quarter pan well and keeps the item in the oven from getting soggy in its fat. Also can be used as a cooling rack. This cooling rack is great to use with the one-fourth sheet pan. It's is made well and should last a long time Prefect for smaller jobs. Just as all the other reviewers have stated, this rack fits perfectly in my 1/4 sheet pans. It is sturdy and cleans up easily. There has been no warping and time will tell how well it holds up. I will definitely order more since I seem to be using these on a daily basis for everything! This rack fits perfectly inside a quarter sheet tray. Works great for cooking bacon, resting cooked proteins, and cooling baked items. The rows and columns of thin metal that form the rack aren't exactly even and square but still functions the same. Great value overall. These are great. I use these on quarter size baking sheets to rest meats, and they're the perfect size for a busy kitchen. Highly recommended. What a great invention for anyone who fries food or bakes. We put this either on a cookie sheet when we cook and bake. It washes 100% clean and stays in our cupboard nicely. We also purchased other sizes for our cookie sheets when we cook or bake in a larger volume ... It is worth the money for us and your homer or business also. this footed cooling rack fit perfectly inside the bakers mark quarter size sheet pan! I use this mainly to drain excess liquid from marinated meat. it works just great! You can use this as a cooling rack, but if you bake on it, be sure to spray it with non-stick oil first. The feet on the bottom are the perfect height that you can still use the matching lids and get full closure. Great for glazing or keeping crisp food items crisp. Be careful when first inspecting as sometimes sharp wires stick out and can cut your hands. This actually fits in a standard size roasting tray pretty well as well as my 1/4 size sheet pan. Obviously great for baking and cooling a small batch of pastries or cookies. We use this 8 and a half by 12 inch footed cooling rack when cooling our banana breads. It’s the perfect size. When used with quarter size pan, this will prevent the food item from sticking. And it’s chrome-plated so it’s easy clean-up afterwards. This is a good product. These cooling racks are amazing. I already owned a couple of the larger, half-size cooling racks, but found them excessive when baking or cooking in smaller batches. These little guys ended up being perfect. I use them quite often, and they cannot be beat for the quality and price point. This is great! we pair this with the same sized sheet tray. We have one for savory for roasting meats in the oven and resting them, and for pastry to rest baked goods on when out of the oven to let the air circulate and cool them! This is a great cooling rack! I use it on top of a sheet pan and bake chicken cutlets so the grease drips right off in the oven! We love these cooling racks. They are very well made and fit the sheet pans perfectly. We use them under the broiler all the time and they clean up very easily. We allow them to dry completely before storing them and there are absolutely no signs of rust or wear on any of them. I have lots of cooling and draining racks for my larger half sheet and full sheet pans, but I always forgot to get smaller ones until I needed them and didn't have them. These are great for all kinds of smaller tasks like cooling small batches of baked goods and draining single orders of fried foods. Great grate for cooling pans and many other things. It is also very good to use over wax paper or whatever for decorating various items. The grate has many uses. It's been used for cooling baked goods, roadting meats so that there is even cooking and also for dicing eggs for salads. This is a good product - it's easy to clean, it's lasted a while and I don't see it failing us anytime soon, and it does it's job. We always spray these down with non-stick spray before use because they're not as easy to clean without it. This draining grate works just fine and good for the price. It arrived with some of the steel thread sticking out, but I was able to file down this wayward threads. It fits inside the quarter size 19 gauge wire In rim aluminum bun/sheet pan perfectly, but not my other two (different brand) quarter sheet pans. I am also surprised at the rust that has already appeared even though I dried the racks & set it on the counter for a while before storing. Overall it was decent for the price, but I would not purchase again. Rack fits perfectly in a quarter sheet pan. Great for cooling baked goods, draining fried chicken, and cooking bacon in the oven (when paired with the pan). Dishwasher safe too! This is very useful heavy duty rack that fits perfectly inside of a full sheet back. Very useful as a cooling rack and for baking or roasting meats. These cooling racks for my quarter size sheet pans perfectly. The construction feels sturdy and they have not rusted. I am very pleased with them. I use this drain tray for service only. It is useful for draining small batches of fried items. I also like to pass avocados through the racks to make guacamole! We had to have this. It fits in the small trays. We use it for seasoning the meats and it takes up a small area on the station for the cooks. When I pulled the label sticker off one of the grate wires came off with it (not completely off, just at one of the ends). As I checked the other grate wires not all the joints were actually connected. Because the wires are so thin they flex pretty easily to check. The wires are about half the diameter of the Vollrath Stainless Streel Grate that I also purchased (the Vollrath grates do not have any issues so far). Doesn't speak much for the durability. All of them also developed rust spots at the joints when I washed them before the first use. They were hand washed and air dried. Thank you for your review, John. We are sorry to hear that the item you received was faulty. A Customer Solutions Representative will contact you soon to get this issue taken care of. Nice, sturdy rack that is a perfect fit for a quarter size sheet pan. Very useful for cooling baked goods, glazing baked goods, or draining fried foods. Just like the half size, these are very strong. I have one of these and the half size along with two 1/4 and two 1/2 sheet pans. With this set-up I can do just about anything I need in my kitchen. This is a perfect fit for the quarter sized sheet pan, which is a difficult size to find. The product is sturdy and easy to clean. We use this draining grate combined with our 1/4 size sheet pan on the bottom section of our convection oven to catch any droppings of cheese or sauce from our flat bread pizzas. Very functional. As with many other product on this web site, i liked this product so much I purchased a second one. It is perfect for draining fried chicken after it is cooked. This draining grate can also be used as a cooling rack. What I like about this the most is not only size but the weight and sturdiness of this grate. It is just me and my daughter, so the quarter size is perfect. This is a good quality product. Fits the 1/4 pan perfectly and is nice and sturdy to use for draining fried goods or cooling small batches of cookies. Good quality for a low price. 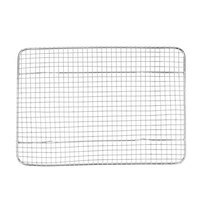 This is the perfect size draining grate/cooling rack for small jobs in the kitchen. A lot better than using a full size grate when you are only making a dozen cookies. Easy to clean. Good purchase. These quarter size grates are super handy. Especially useful as a space saver on the counter when cooling a single loaf of something or small batch baking amidst other cooking. An absolutely perfect fit for one-fourth size sheet pans; they are sturdy and reinforced for strength without weighing too much. These grates are nicely finished with no sharp edges. A good value, as always. Very great quality and multifunctional. The smaller size is perfect for home use. Not only do I use it to cool my baked goods, but it serves as a great draining rack for fried foods (turn it upside down and put over a piece of paper towel) or for when I pour on glazes and ganaches. Excellent product for resting meats, cooling cookies and bread and even roasting meats!! Great multi-use product! Worth every penny! Durable and long lasting!! Can not be the price!!! I purchased this item with the intent to dry my coated meat or fish before I fry it. It works beautifully now my crust clings to the meat or fish and the coating is crisper. Thank you I looked for this rack for a very long time before I found it at WEBstaurant.